These gummies are wildly delicious! Natural fruit flavors in orange, cherry and green apple. Designed specifically to meet the nutritional needs of children who may not be able to get enough vitamins from diet alone. This formula also contains the family of B Vitamins, including B6, Folic Acid, B12, Biotin, and Pantothenic Acid. B Vitamins are primarily known for supporting energy metabolism. † Each B Vitamin performs a unique role in maintaining proper metabolic functioning.† Folic Acid plays a significant role in the formation of new cells by being involved in DNA and RNA synthesis.† Natural food sources for B Vitamins include meat such as turkey, tuna and liver as well as eggs, milk and peanuts. Foods with Vitamin C include strawberries, kiwifruit, oranges, grapefruit, cantaloupe, tomatoes, red pepper, green pepper, broccoli & potatoes. Vitamin D’s major function is to support bone health by enhancing calcium and phosphorus absorption and maintaining healthy blood levels of these minerals.† Adequate Calcium and Vitamin D throughout life, as part of a well-balanced diet, may reduce the risk of osteoporosis. The American Academy of Pediatrics and Institute of Medicine both recommend children and adolescents receive 600 IU of Vitamin D per day. These gummies provide 600 IU of Vitamin D per serving for children 4 and up and 300 IU per serving for children 2 to 3, which helps to secure their intake requirement. Excellent sources of Vitamin D include salmon, mackerel and mushrooms as well as milk, egg yolks and cheese. 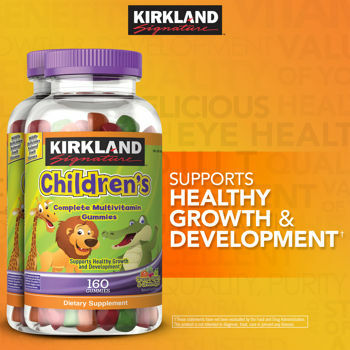 SUGGESTED USE: Children 2 and 3 years of age: Chew one (1) gummy daily. Children 4 years of age and older: Chew two (2) gummies daily. CAUTION: If you are pregnant, nursing, taking any medications, planning any medical or surgical procedure or have any medical condition, consult your doctor before use. Discontinue use and consult your doctor if any adverse reactions occur. This product requires adult supervision and is not to be dispensed by children.